Chromo genic substrates are used in colorimetric detection. They are simple and easy to use. 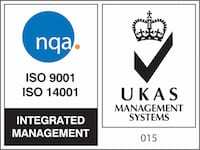 Suitable for most immunotechniques – from immunohistochemistry to Western blotting and ELISA, they offer a very cost-effective method of detection. Chromogenic substrates can be used in a number of immunohistochemical applications from staining tissue with IHC through to Western blotting. 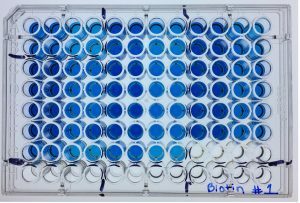 Chromogenic substrate is added to a blot or tissue previously incubated with an enzyme-conjugated antibody (typically horseradish peroxidase (HRP) or alkaline phosphatase (AP)), which converts the substrate to a colored precipitate. Signal development is arrested by simply washing off the substrate. The precipitate is visible to the naked eye, and on a Western blot it can be detected without special equipment as a colored band. Chromogenic precipitate can be seen on tissue under a normal light microscope when used for immunohistochemistry (IHC). Colorimetric detection is easy to use, although it may require optimization or additional staining to improve signal over background in samples expressing low antigen. Figure 1: Indirect colorimetric detection. A. Reporter enzyme-conjugated secondary antibody detects the primary antibody for the protein of interest. B. Chromogenic substrate is added to the antibody-antigen complex. C. The reporter enzyme conjugate catalyzes the conversion of the chromogenic substrate to a colored insoluble precipitate, visible by eye on the blotting membrane. Chromogenic reagents are available for the different reporter enzymes, HRP, AP, GOD (Glucose oxidase) and β-Gal (β galactosidase). The substrates are available in different colors and sensitivities. Depending on the assay, a soluble or insoluble substrate can be chosen. Alcohol insoluble chromogens are appropriate for Western blotting and IHC where counterstains or mounting media are used. The soluble dyes are better suited to ELISA and plate based assays. When used in Western blotting or dot blotting, the chromogenic substrate appears as colored band or spot on the membrane at the locations of the immobilized antigen – antibody complexes (Figures 2 & 3). The blot can be developed until the signal of the bands reach the intensity required, this allows for a good level of sensitivity as the development of the blot can be observed directly and the reaction halted immediately by washing off the substrate. The developed membrane can then be imaged or stored for subsequent use. Samples with low sample concentration (low antigen) may require extended development, which may lead to higher background, obscuring bands. 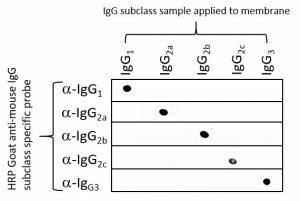 Figure 3: Dot blot showing the specificity of Goat anti-Mouse IgG Fcγ subclass specific antibodies. 100 ng of mouse IgG subclass were applied to 5 nitrocellulose membranes and blocked with 5%(w/v) BSA in PBST. Each membrane was probed with individual HRP goat anti-mouse subclass specific antibodies (115-035-205 IgG1, 115-035-206 IgG2a, 115-035-207 IgG2b, 115-035-208 IgG2c, 115-035-209 IgG3). The blot was developed using TMB substrate (Moss, Inc.). Colorimetric ELISA measures the optical density of a soluble colored product which is usually proportional to the amount of analyte present in the sample, allowing relative quantification of the analyte. Like other immunotechniques, ELISA requires optimization of timing and development conditions to obtain accurate and reproducible assays. Figure 4: Chromogenic substrates can be used for ELISA, the colour change can be detected by a plate reader which measures light absorbance of the sample. Sample concentration can be determined by comparison to a standard curve generated with a with a positive control. The 96 well microplate format lends itself to automation and replicates. Colorimetric detection can be a very sensitive method for the immunostaining of tissue and cells. Different substrates offer different sensitivities and colors to aid identification, multiple antigen recognition is possible as colours can be distinguished from one substrate and another. A number of counterstains are available which can be used to increase contrast so that the IHC staining appears stronger. Figure 5 shows the brown color of 3,3’ diaminobenzidine (DAB staining) in combination with haematoxylin counter-staining of nuclei. 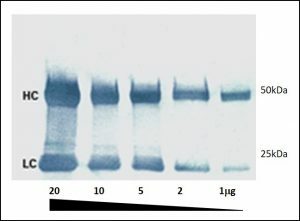 Figure 5: Anti-GFP immunohistochemical staining using Biotin-SP conjugated Donkey anti-Rabbit IgG (H+L) Secondary antibody followed by HRP streptavidin: (A) At 4 weeks post-transplantation, no GFP signal could be detected in the in vivo specimens. (B) GFP expressing cells were visualized by brown staining in the positive control; Signal was visualised using the chromogenic substrate 3,3’ diaminobenzidine (DAB) substrate (Envision kit; DakoCytomation, Glostrup, Denmark) for 10 min at room temperature. Nuclei were counter-stained with haematoxylin. The most commonly conjugated reporter enzymes are horseradish peroxidase (HRP) from the horseradish plant Armoracia rusticana, and alkaline phosphatase (AP) from calf intestines, although Glucose oxidase (GOD) and ß-D-Galactosidase from E.coli can also used. HRP and AP both offer different benefits depending on the application requirements. HRP is a small 40 kDa molecule which usually binds to an antibody in a ratio of 4:1. It’s small size means good intracellular penetration and it’s less likely to cause steric hindrance with the antigen/antibody complex. AP is slightly larger (86 kDa) which may cause steric interference but the substrate-converting reaction is linear, which may mean the detection incubation could be extended and potentially be more sensitive. AP also removes the possibility of non-specific staining of tissues with high levels of endogenous peroxidases – a limiting factor in HRP. Each reporter enzyme can be used with a number of different chromogenic substrates which are available in a variety specifications and formats offering different sensitivities, some common ones are summarized in the table below. Table 1: Commonly used colorimetric substrates. TMB in the presence of peroxide and HRP can be precipitated into membrane. T-NBT may be used in combination with BCIP.